The inner bag is 8.2*6.3*0.78 inches, It is also the size after folding, very easy to take to anywhere. The bag can work as chest bag, shoulder bag, sling bag, travel organizer Etc,It is perfect for outdoor sports (hiking, camping, climbing, running, cycling, bike riding, etc), outings, travel/vacation, trips to the amusement park, baby bag (carry around diapers and wipes) or so on, multifunction for many of your purpose. The bag is packable, can be folded into a small pouch and expanded to a large backpack.Its a very good standby pack during your trip. 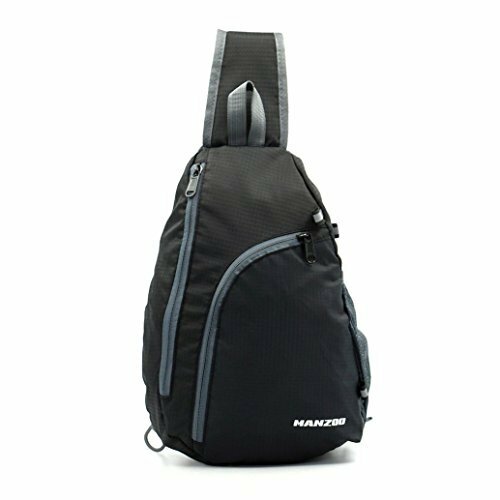 Its a Great flexibility backpack, can be used both as chest pack and shoulder bag; Strap is adjustable to be tight/loose, to hang as high or low as you want, Fit person from 4feet up to 6.5feet. The Shoulder bag is very comfortable and adjustable for as tight/loose, to hang as high or low as you want.Whatever you wear it at front or back all looks great. If you have any questions about this product by MANZOO, contact us by completing and submitting the form below. If you are looking for a specif part number, please include it with your message.